While lasers were invented in 1960 and are commonly used in many applications, one characteristic of the technology has proven unattainable. No one has been able to create a laser that beams white light. The researchers have created a novel nanosheet — a thin layer of semiconductor that measures roughly one-fifth of the thickness of human hair in size with a thickness that is roughly one-thousandth of the thickness of human hair — with three parallel segments, each supporting laser action in one of three elementary colors. The device is capable of lasing in any visible color, completely tunable from red, green to blue, or any color in between. When the total field is collected, a white color emerges. The researchers, engineers in ASU’s Ira A. Fulton Schools of Engineering, published their findings in the July 27 issue of the journal Nature Nanotechnology. Cun-Zheng Ning, professor in the School of Electrical, Computer and Energy Engineering, authored the paper, “A monolithic white laser,” with his doctoral students Fan Fan, Sunay Turkdogan, Zhicheng Liu and David Shelhammer. Turkdogan and Liu completed their Ph.Ds. after this research. The technological advance puts lasers one step closer to being a mainstream light source and potential replacement or alternative to light emitting diodes (LEDs). Lasers are brighter, more energy efficient and can potentially provide more accurate and vivid colors for displays like computer screens and televisions. Ning’s group has already shown that their structures could cover as much as 70 percent more colors than the current display industry standard. Another important application could be in the future of visible light communication in which the same room lighting systems could be used for both illumination and communication. The technology under development is called Li-Fi for light-based wireless communication, as opposed to the more prevailing Wi-Fi, using radio waves. Li-Fi could be more than 10 times faster than current Wi-Fi, and white laser Li-Fi could be 10 to 100 times faster than LED based Li-Fi currently still under development. 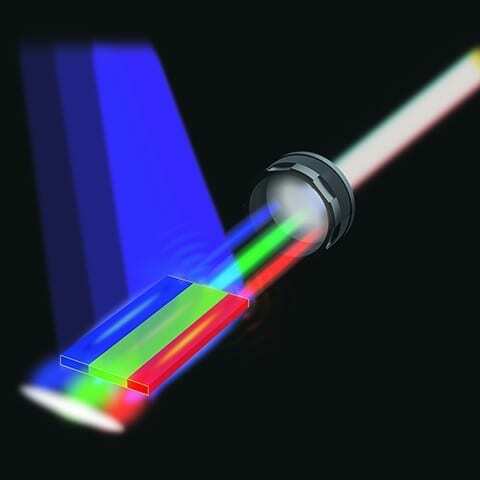 “The concept of white lasers first seems counterintuitive because the light from a typical laser contains exactly one color, a specific wavelength of the electromagnetic spectrum, rather than a broad-range of different wavelengths. White light is typically viewed as a complete mixture of all of the wavelengths of the visible spectrum,” said Ning, who also spent extended time at Tsinghua University in China during several years of the research. April 12, 2019 - Lasers Enhance Traditional Machining Advanced ManufacturingNext-generation CNC machines combine traditional machining with laser cutting, welding, and additive manufacturing -- aka multitasking or hybrid machines. April 10, 2019 - Laser Cutting Powers Up Advanced ManufacturingNot only are fiber lasers for cutting applications dominating the market, their quality is improving with increased power, speed, and capability. April 1, 2019 - Help for light-hair laser reduction Dermatology TimesPipeline topical silver photo-particle solution aids laser in removing tough-to-treat white, gray, blonde, light red and light brown hair.